Artists and Reader in Art and Media Practice at Camberwell College of Arts, Sigune Hamann recently began a residency at Oxford University with an exhibition of several photographic projects at the world-renowned Ashmolean Museum in March this year. 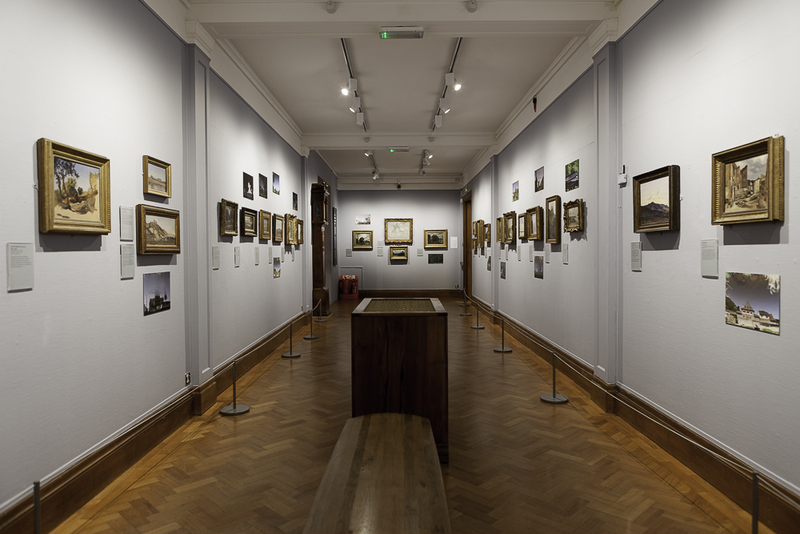 Exhibited amongst the museum’s diverse collections which contain objects dating from 8000 BC to the present day, Sigune’s work included photographs from a current collaboration with the Oxford’s Experimental Psychology department entitled Freshers and her series heimlich which was on display in the museums’s collection of small oil landscapes. We spoken to Sigune about the residency, working with neuroscientists and the relationship between memory and perception. From the triptych Freshers by Sigune Hamann. At the Ashmolean I exhibited photographs from a new photographic series called Freshers, the complete series heimlich taken during a TrAIN (UAL’s Research Centre for Transnational Art, Identity and Nation) residency in Germany and diorama (colour channels), a small object launched with the Multiple Store in 2013. The series heimlich, which consists of 20 photographs, was taken in 2007 during a residency at Künstlerhaus Schloss Balmoral in Germany not far from the place where I grew up. I photographed reflections on the surface of the river Lahn. The reflected buildings, landscape and sky are presented upside down as mirror images. The movement of the water creates movement in the images (distortions and abstractions) that take on the quality of an elusive memory. The images make visible something that is there but is not normally recognised. They are photographic, realistic and distorted even though they are not digitally manipulated. The floating character of the water surface evokes mental images and memories. The title of the series, heimlich, relates in the original meanings of the German word to the homely/familiar as well as to something secretive and hidden and to my ambigious feelings of being so close to home. One section of the Fresher triptych on display at the Ashmolean Museum, 2017. Museum objects © Asmolean Museum, University of Oxford. Freshers is part of a research project during my residency at Oxford University. Re-lation is a photographic project juxtaposing images of social scenes into new inter-changing narratives. The original images are cut in half and re-combined to create new situations and narratives. I photographed newly arriving psychology students introducing themselves to each other in pairs on their first college day at Oxford University last October. The photographs can be combined flexibly into many new social configurations of varying expressions of social ease and communication dependent on our own individual readings, memories and expectations. Installing them in groups of three shifts the dynamics and accentuates the juxtaposition, but interestingly people continue to read them as one scene. This research during the residency at Oxford University explores how the playful experimental treatment and handling and viewing of images can test and shift our perception of ourselves relating to others/strangers. As in the heimlich series this deals with the way we respond to the familiar (home) and the other (strangers), which is, especially interesting in the light of Brexit. 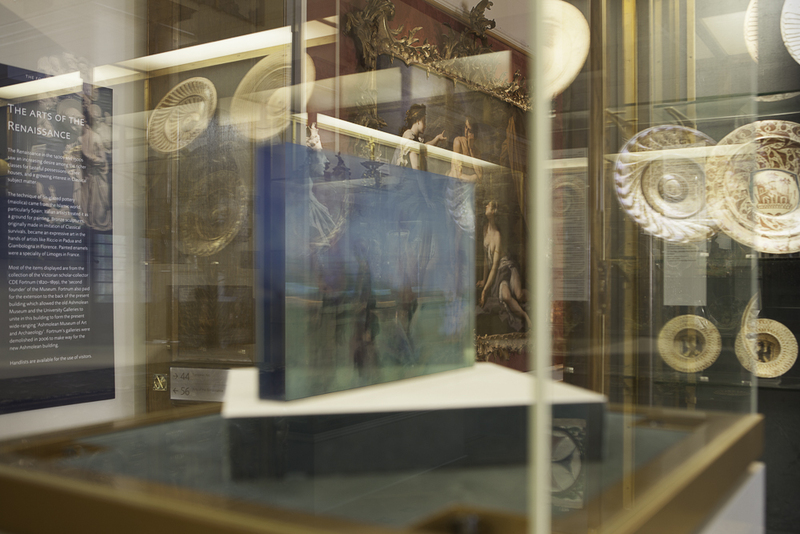 The Ashmolean is a huge and really rich resource, how did you choose which items in the collection to respond to or make work about as part of the residency? Initially I wanted to show the new series Freshers and ideas developed working with teaching curator Jim Harris and also the neuroscientist Crystalina Antoniades, who was interested in my upside down landscape photographs and we planned a week of events under the name of The Upside-down Brain: Art and Neuroscience at the Ashmolean. 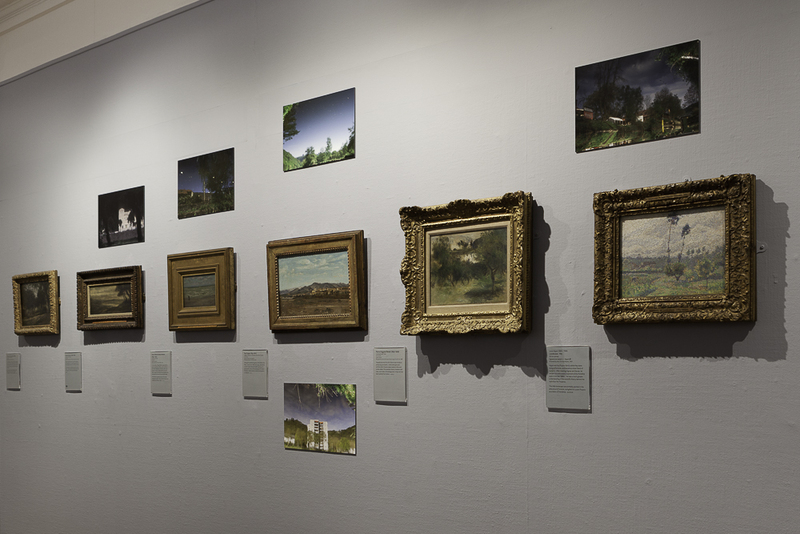 I used to come to the Ashmolean on day trips to Oxford and found it quite a labyrinth of different routes across old and new galleries through this rich collection that grew by many bequests over time. I have some favourite paintings, like the El Greco Portrait with its gaze and gesture, but the interventions Jim Harris and I planned were about creating interactions with the collections. I have always been attracted by the modesty of the landscape oil sketch gallery and the openness of the studies that were never intended for public viewing. Hung to create a horizon line on light blue walls, a timelessness allows the landscapes to invade the small gallery space. What connects them to my heimlich photographs apart from the formats is that they are observed and painted from nature showing the fleetingness of the moments that are quickly changing with the wind, the weather and the light – artists like Constable returning to the same site well known to them over time. The juxtaposition of the inverted landscape photographs with the paintings create a dynamic instability and triggered a perceptual reorganisation in ourselves, adjusting and turning the images in our minds that connects with neuroscience research. One section of the Fresher triptych on display at the Ashmolean Museum. 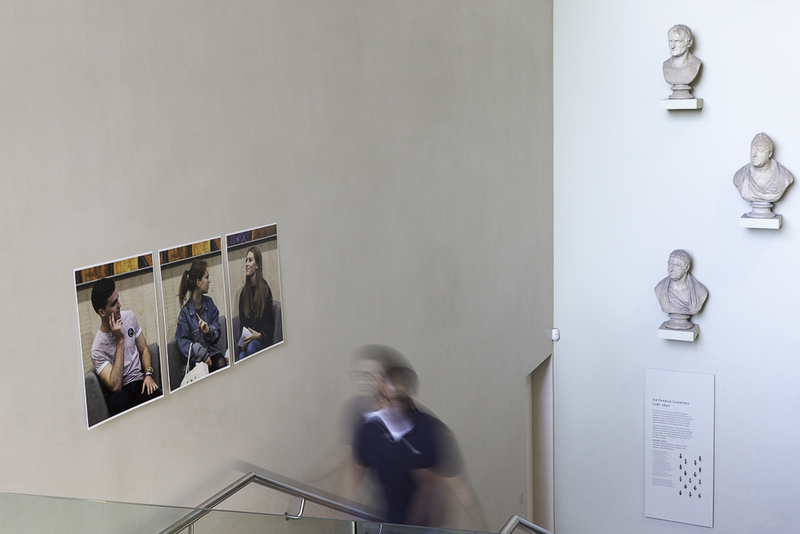 Visitors encounter the triptychs Freshers approaching from the displays of ancient Greek pottery moving into the vast contemporary staircase with portrait busts by Sir Francis Chantrey. Since my installation and online project walkalone-neverwalkalone at the Harris museum responding to Greek and Roman friezes of sport and war, I have been interested in their depiction of groups of people in movement and how this relates to my panoramic film-strips. There is an ambiguity if the people in silhouettes are instances of the same person over time or different people doing similar activities. These temporal and spatial shifts are evident in the ancient Greek vases at the Ashmolean showing silhouettes of mainly women in daily life and in the taking of the photographs of students in the same position over time and their juxtaposition into new narratives. The triptych of various combinations of students photographs are hung over several levels parallel with portrait Chantrey busts. Showing people of his time in naturalistic style, these plaster casts were some of the first shown as final pieces as well as stages in the process of production. 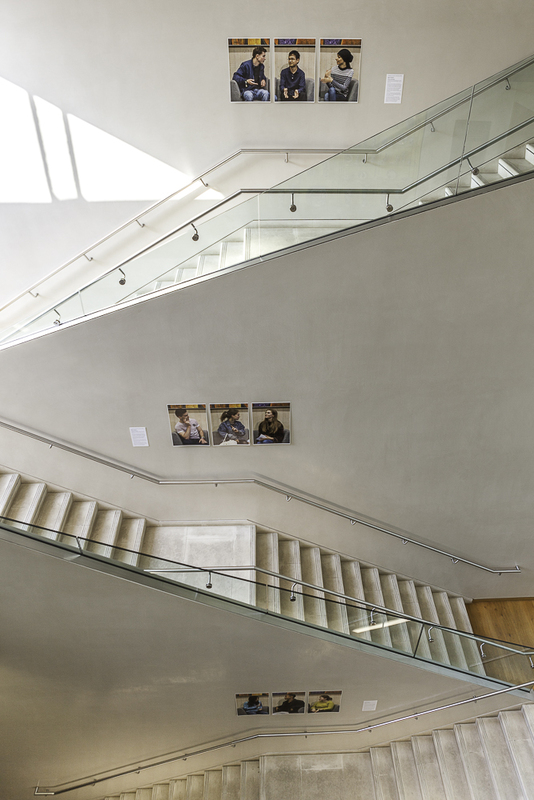 The different directions of the heads in the sculptures and photographs connect with viewers and define the open space of the staircase. We showed Diorama (colour channels) in one of the Renaissance galleries where the transparent images of people walking overlap with multiples/objects and paintings of the time. How did the residency come about? For me these events mark the beginning of my residency working with Kia Nobre in Experimental Psychology and Cognitive Neuroscience. I am aware of scientific developments relating to my research and I have done projects in the past with the Wellcome Trust, including my installation Wave and student window installations about the changing perception of images. I was very interested in Prof Kia Nobre’s research in attention across psychology, psychiatry and cognitive neuroscience – we share a curiosity in the way our memories and our expectations shape what we see. Attention research in how we actively process information in our environment has made huge advances in the last years, developments that strongly relate to art and design practice and to the ways we teach. Kia and I have been in conversation for some time, Kia visiting my studio and introducing me to her lab which have given me insights that are different to my own perceptual understanding. This exchange is very stimulating for me. It’s great to develop work in the context of a residency allowing for a new dynamic in my practice parallel to Kia’s work process. And we hope that our shared parallel pursuits will open up new insights, a space where unexpected ideas can evolve. Part of Re-lation is a teaching and learning project with Jonathan Kearney, course leader MA Digital Arts at Camberwell where art and design students meet science students to test and develop a common language/space. Can you please tell us a bit about your practice generally? My work encompasses photography and video with a focus on stillness and movement, narrative structure and perception. I deal with the passing of time in the fixing of an image and the perception and recollection of events using images. Most of the recent projects start with the dynamics of groups of people in urban environments. This includes capturing photographic panoramic film-strips over several minutes of demonstrations and marches where a common goal directs people into common movement. But also more intimate encounters of strangers in participatory workshops such as the student introductions or photographing local people in emergency training in Tokyo last year. As an artist I am dealing with the role they have in the image and beyond. That becomes interesting with the displays of the work and the gradual accumulation of the images in the viewing: In the 360 degree film-strip installations the viewers can re-experience the time sequence of the, often more than 50 meters long, photographs. 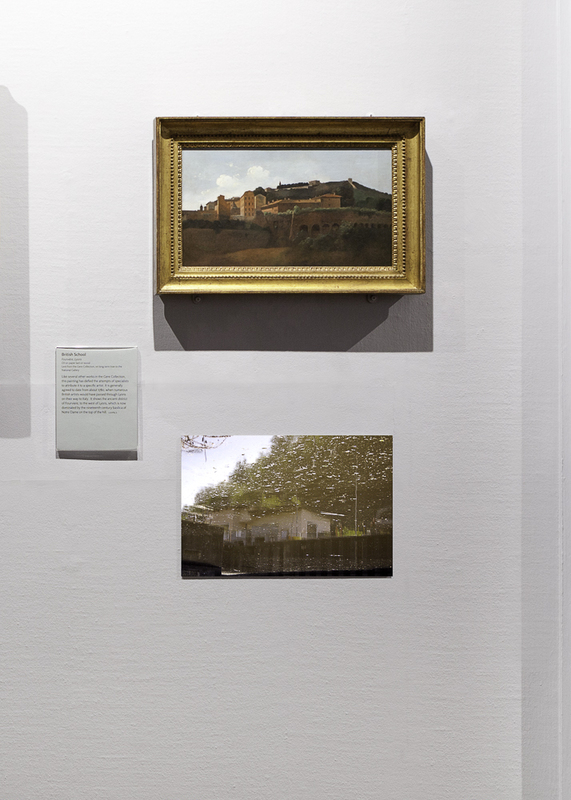 During my solo exhibition at Durham Museum I positioned portrait photographs across Durham city on billboards, fences and in empty shops and similarly at the Ashmolean the works were encountered gradually in different parts of the collections. I enjoyed my walking conversation as part of the events through the collections connecting pieces from different places and times, as I have done in many projects. And how in juxtapositions, such as in renaissance chapels or my own installations, the spaces between the images work as a net of pictorial hinges that evokes a new dynamic or narrative plot. Visit Sigune Hamann’s research profile.